Heuer, the company that preceded TAG Heuer, manufactured their first dash counter for racing cars and aircraft in 1933, calling it “Autavia” which is a contraction of AUTomobile and AVIAtion. By 1962, the CEO, Jack Heuer, decided to start making Autavia wristwatches, which like the dash counters were designed for racing. They became so popular they remained in the collection until 1986. Naturally, those Autavias wristwatches and dash clocks, which have achieved vintage status, are all highly collectible now. Fast forward to Baselworld 2017 and TAG Heuer launched a close re-interpretation of the 1966 Heuer Autavia Ref. 2446 Mark 3 Rindt, which was named after famous F1 driver Jochen Rindt. 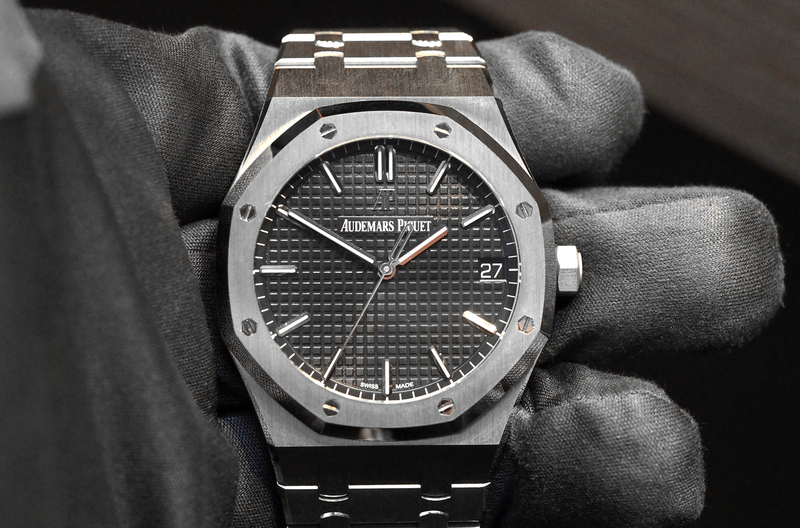 That model comes with a reverse Panda dial (black dial with white counters) and a slightly larger 42 mm case, as opposed to the 39 mm case of the past model. Also, the movement is now manufactured by TAG Heuer whereas the old Autavias used Valjoux calibers. Lastly, the bezel is wider on the modern version. Following the initial Autavia launch, last fall TAG Heuer introduced the Autavia Jack Heuer 85th Anniversary Limited Edition, limited to 1932 numbered pieces representing Jack Heuer’s birth year. The new limited edition Autavia features a so-called “Panda dial”(white dial with black counters), with redesigned bezel graduations, a solid caseback versus exhibition, and a few other changes, otherwise, it’s specifications are the same. One of the first things you will notice when you look at the Autavia dial is the beautiful brushed silver surface of the dial, which has a sunray effect – meaning the brushed pattern starts in the center and goes outward. Despite not referencing a past model or being painted with faux patinated lume, the dial has classic good looks. Another construction element that stands out is the large rectangle-shape applied indices which are unique in that they utilize both vertical brushed and polished surfaces. There is also a lume mark on the tip of each hour marker. The steel hour and minute hands are baton-shaped and have been rhodium-plated, polished, and have white lume which turns green in the dark. The steel central chronograph second hand is baton-shaped with a polished finish. While not a true white panda dial, in certain light the dial appears white, so perhaps you could get away with calling this a true panda dial. Despite not referencing a past model or being painted with faux patinated lume, the dial has classic good looks. Beating inside the Autavia is caliber Heuer 02 which is an in-house designed and manufactured column-wheel actuated chronograph with a vertical clutch. I cannot think of another chronograph with a vertical clutch at this price point. A vertical clutch not only reduces the violent vibration of the chronograph second hand when you hit start compared to a horizontal clutch or cam operated design – it also prevents loss of power from the chronograph that would otherwise negatively affect the timekeeping rate of the watch. That is why a column-wheel with a vertical clutch is regarded as the most premium configuration for a chronograph. 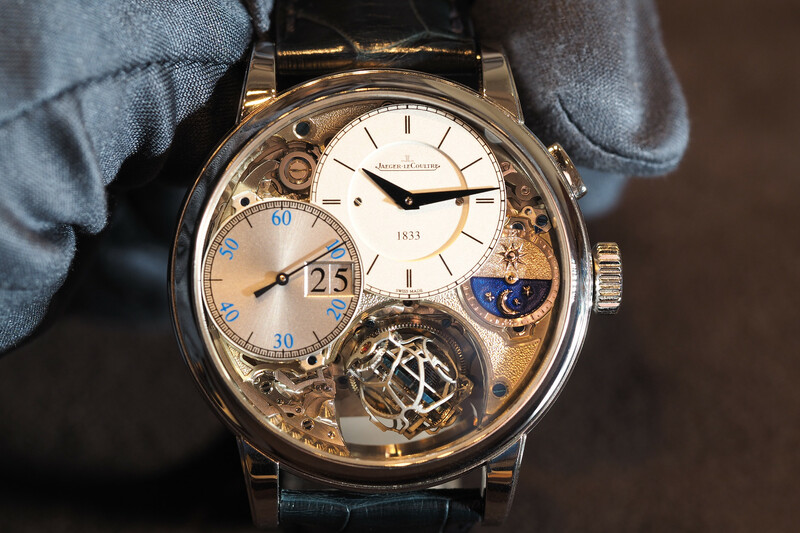 And why vertical clutches are mostly seen on watches costing quite a bit more. A generous 80-hours of power reserve via a single barrel allow the watch to run autonomously for more than 3-days, even if you set it down the entire time. The movement measures 31.0 mm x 6.95 mm and is made of brass and that’s been rhodium or ruthenium plated and then finished with machine-made industrial style Geneva stripes on the bridges and a sandblasted finish on the mainplate. Even the edges, which are not chamfered, are spartan compared to what you’d expect from a watch movement that is Swiss and twice price. But of course, that is part of the reason they can offer so much watch for such a fair price. The oscillating weight has been darkened and skeletonized. Red paint has been applied to the top of the column wheel, to make it more visible. Screw heads have been polished. The regulation assortment which consists of the balance spring, balance wheel, pallets, pallet fork, and escapement is adjusted via an index regulator as opposed to a more premium free sprung configuration (one of the ways TAG Heuer has commercialized a movement that offers so much value without a high price). The Heuer 02 beats at a rate of 4Hz (or 28,800 vph) and has 168 components (33 of which are jewels). Unfortunately, you cannot see the movement on the limited edition version, but you can view it through the clear caseback on the standard Autavia model (pictured above). Dimensionally the Autavia has really good proportions for a sports watch. Not huge but not small. Just about right. The circular case that measures 42 mm in diameter (42.5 mm with the bezel which sticks out about .5 mm further than the case) is 16 mm thick. A number of reviewers including myself have commented that the watch is thick at 16 mm (including the domed sapphire crystal). But after trying the watch for more than 20 minutes I realized it’s not so bad. Yes, the bulk does make getting it under a shirt cuff harder than with say a flat dress watch. But the point is this is a sports watch and so relatively speaking it’s about the same as many other sports watches. Moreover, you could say there is a point where too thin messes with the proportions of a watch and look too dainty. Interestingly, the lugs have an appearance similar to the straight lugs on certain Omega Speedmasters. The entire exterior of the case, including the coin edge of the steel bezel, and the bracelet, has been completely polished, which is appealing, although will surely show a lot of scratches over time. At 183.1 grams with the steel beads-or-rice bracelet attached, the watch is heavy, as you would expect. However, it’s well worth the weight, as the style of the bracelet is an awesome throwback to the past. However, if you want a slightly more comfortable feel, just order an extra leather strap from TAG Heuer or one of the countless retailers online, or on Instagram. The 7 mm diameter push-in steel crown is embossed with the old school Heuer logo and did not dig into my wrist at all. It’s relatively flat. Across the wrist, lug to lug, the case measures 50.5 mm which means it sits on my 7.5″ circumference wrist nicely without hanging over at all. 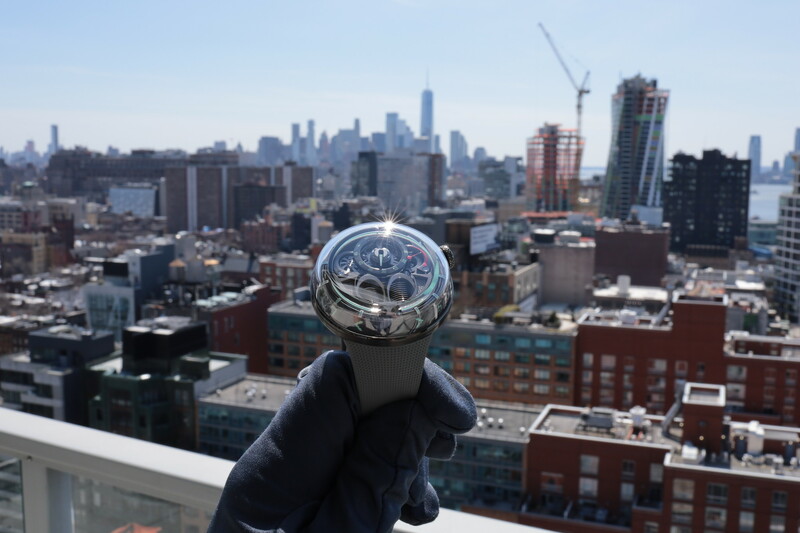 There is a 60-click rotating bezel, and while it’s not designed for diving, the 100-meters water resistance would allow it to be used as such should you choose. Although it does rotate bi-directionally so it’s not safe for real diving despite a sufficient depth rating. I love the smooth quality feel of the rotation of the bezel. And the new markings on the black aluminum insert, which focus on the 0-60 – but also include 0-12 – make the bezel more versatile than the standard model, as well creating a new aesthetic that I definitely prefer. Many have commented on the width of the new bezel compared to its thinner predecessor, and I don’t disagree that this would probably look better with a thinner bezel. That said, the redesigned markings on the limited edition version really mitigate this point of contention quite well. The interlug width is an odd 21 mm, as opposed to a more standard 20 mm, but with many straps, you can go up or down a millimeter without much issue. The steel bracelet tapers down to 18 mm at the buckle. A solid screw-in caseback with a special engraving and limited edition numbered (XXXX/1932) finishes off the case. Whether it’s the gorgeous silvered Panda dial that’s impeccably finished right down to the vertically brushed and facetted applied indices, or the retro styling of the beads-of-rice steel bracelet, or the in-house column-wheel with vertical clutch – for $5,900 there is not much close to this watch in terms of value on the market from a top-tier watch brand. You may want to also consider the Jaeger-LeCoultre Deep Sea (which has column-wheel and vertical clutch chronograph, as well as a free sprung balance, but also a significantly higher price tag) or the Omega Speedmaster Moonwatch (which is a great watch, but features an older manually wound movement). 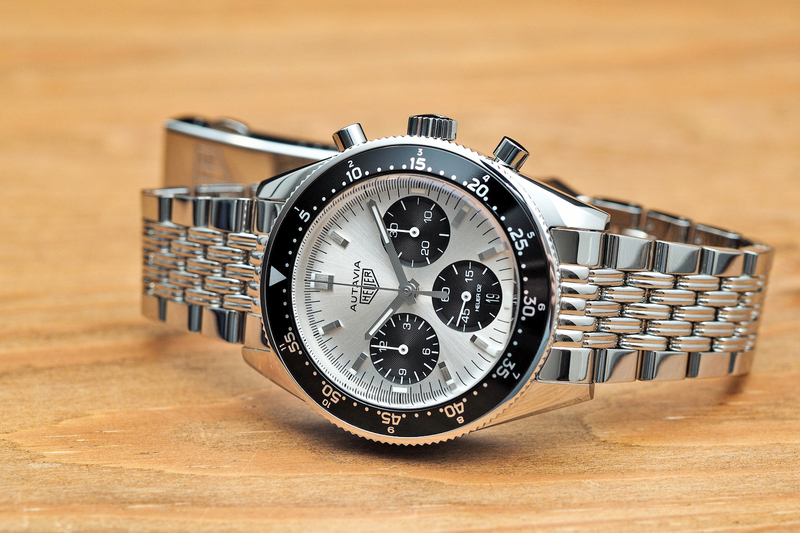 Although, at a retail price of $5,900 the Autavia (Ref. CBE2111.BA0687) is hard to beat.